Chibi-Robo! (ちびロボ！, lit. Little Robo!? ), fully titled Chibi-Robo! Plug Into Adventure in North America, is a platform/adventure video game for the Nintendo GameCube video game console. It was developed by skip Ltd. with collaboration from Nintendo, and was published by Nintendo in Japan, North America and Europe. It was first released in Japan on June 23, 2005, and was later released in North America on February 6, 2006 and in Europe on May 26, 2006. It was directed by Kenichi Nishi and Hiroshi Moriyama, and produced by Shigeru Miyamoto. One sequel for the Nintendo DS titled Chibi-Robo: Park Patrol was released on October 2, 2007 in North America and is exclusive to Wal-Mart in the US. A second sequel titled Okaeri! Chibi-Robo! Happy Richie Dai Souji! for the DS was released on July 23, 2009 in Japan. Chibi-Robo! was also re-released in 2009 for the Wii as part of the "New Play Control!" selection. 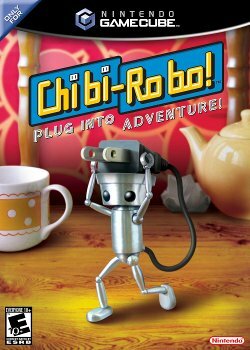 Chibi-Robo! is about a small robot of the same name. He is given as a birthday gift to Jenny Sanderson, a girl who wears a frog hat and only speaks in ribbits, by her father, much to the dismay of his wife who is upset over how much he spends on toys despite his unemployment. Chibi-Robo comes with a small house and an assistant named Telly Vision, and must charge himself at electrical outlets occasionally. Each Chibi-Robo in the world is supposed to collect Happy Points by doing good deeds and making people happy. This page was last edited on 25 September 2015, at 02:46.